A native of Chile, Otto Schade took his vibrant art to England in 2005. After attaining an architecture degree in Concepción, Otto began his career as an urban sculptor. But it was his fascination with surreal art that led him toward his passion to paint. Inspired by masters of the past like Dali, Magritte, Miro, Giger, and Beksiński. Combining his love for architecture and art, Otto began painting creative pieces with one-of-a-kind urban contemporary themes. Originally starting with oil paint on canvas, Otto explored various styles and mediums from collages, to illustrations, to stencil free-hand spray paint on canvas and walls. Otto quickly found the local street art scene, where he painted pieces boasting a sharp and ironic twist. While communicating anti-war themes along with his trademark ribbon style, he earned a street cred name, Osch, in London’s district of Shoreditch and beyond. Since then, Otto’s art has gone global. He has participated in some of the biggest art festivals, including the “Upfest” in Bristol, “Sand, Sea and Spray” in Blackpool, “City of Colors” in Birmingham and “Hometown” in Berlin. As well, Otto’s pieces have been exhibited in the USA, South America, Africa, Asia and many cities across Europe. The demand for Otto’s unique pieces of art continues. 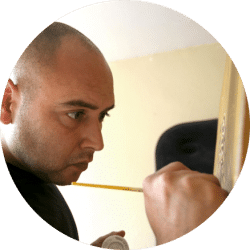 In 2018 alone, he participated in two art exhibitions – one in Paris and one in Berlin – and had the opportunity to paint in the following cities: Miami, New York City, Denver, Lisbon, Paris, Amsterdam, Berlin, Munich and Santiago. In December, Otto was painting a mural in Jamaica. The eclectic works of Otto Schade can be found on the streets of many European cities – including Berlin, Amsterdam, Moscow, Paris, Barcelona, Porto, Luxembourg, Stockholm, Gothenburg, Brussels, and London – and can be viewed in various galleries and exhibition centres across Europe. Otto is available for commissions for art collectors, fashion designers, interior designers and other creative projects.